Home Disney TipsDisney Social Media Moms Celebration	I’ll teach you how to jump on the wind’s back, and then away we go. When I was at Disneyland last month, I took a photo that I am pretty sure I will treasure for a very long time. Jerry and I were on our way out of the park to get ready for dinner when we heard a band playing on Main Street, U.S.A. near Walt Disney’s famous apartment above the Fire Station. We stopped to listen for a while and I decided to snap a photo of the band. As I lifted my camera, a man who had been there all along (yet was somehow invisible) popped into my frame. I immediately included him in the shot and as writers often do, created an entire storyline (in my head) for him in about 30 seconds. He seemed so interesting to me, there all alone in his mismatched patterns. I just couldn’t take my eyes off him. When the band finished, we all clapped and he said a few parting words to the musicians. I suddenly had to speak to him. Completely aware of my weirdness, I hoped he would be kind. He started to leave the park and we were already on our way out so a few steps later, I finally had the courage to say something. We told him it was our first visit and said something about the trumpet player, whom he knew by name. We wished each other well and left it at that. As I watched him slowly make his way to the parking lot, I imagined him making the same trip hundreds of times. I wondered what his favorite bands were and how many other awesome hats were hanging next to his front door. 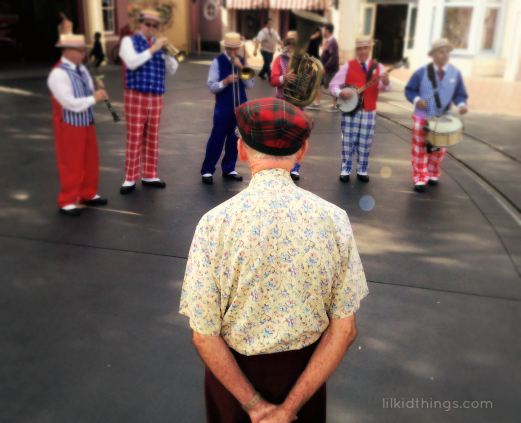 It’s been several weeks and I just can’t stop thinking about this elderly man who goes to Disneyland just to hear the music. What a wonderful thing to do in your twilight years. I suppose I’ve always had a special place in my heart for the elderly. I get it from my Dad who would visit nursing homes every week, preaching and singing old hymns. I went along many times and have a great deal of respect for their wisdom and experience. I remember my own grandparents, who have all passed away, as being full of life until their very last days; always singing, always embracing each day as a new opportunity. I have never been afraid of aging or even death, because I believe they taught me each day is a gift whether it is my first or the last. I sometimes feel silly for my childlike excitement when it comes to Disney. But standing there in Anaheim, with a brass band in front of me and Pluto signing autographs behind me, I was reminded that silly is in the eye of the beholder. Why should we ever grow out of enjoying life? Why shouldn’t we listen to the music and pretend to fly? My grandparents never outgrew those things and this man certainly hasn’t either. Come to think of it, I never did find out the old man’s name. I think I’ll call him Peter. Oh man. I’m kind of fighting off tears here. This is so beautiful. Thank you for sharing your little old man with us. What’s funny is that my FIL just told me yesterday that he and my MIL went to Disney (World) to hear some bands play last month. Somewhere all the way down the boardwalk and at a theater? I was intrigued. This is way more awesome. But beautiful music at Disney making memories for many. This is awesome! He definitely made me stop and listen a little more closely the rest of the weekend. I am sure I will think of him on every trip! You got me with the last line. I love that you created a story for him an got up the courage to speak to him a bit. Other people’s stories fascinate me but especially older folks- they have a lifetime of experiences to share. So true! One of my favorite things to do is hear old stories. We have so much to learn. Wow! I have goosebumps. i think Pete fits this music ma perfectly. This might be my favorite Disney post of all time! I love LOVE this SO much! The image, his simple joy of the music, the story you’ve created – perfection. You are too kind Sara! Thank you so much for reading. Everything about this story is beautiful – the image, the writing, the sentiment. Thanks for sharing. Thank you so much. I couldn’t have asked for a nicer gift. I love this story. I think we sometimes see life through the same lens. Thank you! I have a feeling you are probably right about that.